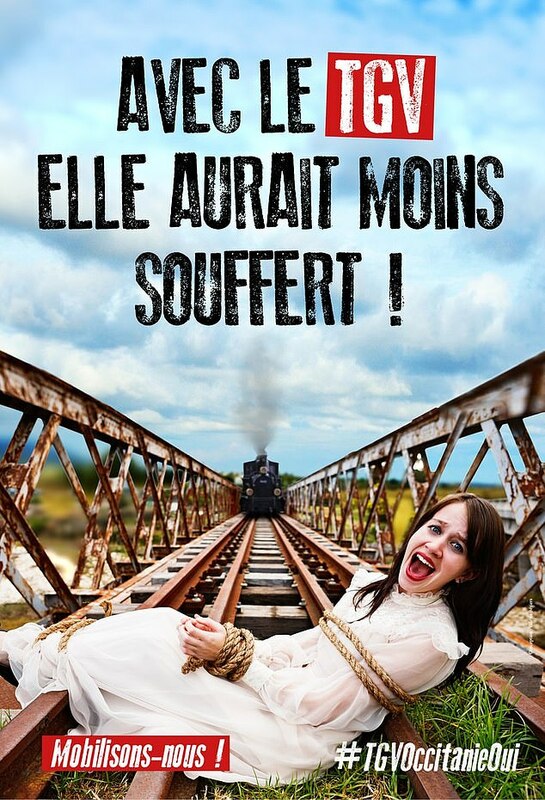 An advertisement depicting a screaming woman tied to tracks as a train advances does not promote violence against women, a French court has ruled. The controversial poster, created by the southern town of Beziers in December last year, was made to celebrate the arrival of high-speed TGV trains to the area. The poster sparked outrage among France's Equality Minister and feminist groups, who mounted a legal challenge after drawing parallels between the poster and the death of Emilie Hallouin, 34, local paper 20 Minutes reported. Ms Hallouin was killed after her husband tied her to TGV train tracks in a murder-suicide in northern France just four months before the town of Beziers debuted its campaign. The town's far-right Mayor, Robert Menard, defended the advert following the uproar, accusing critics of political correctness. Writing on Twitter, he asked: "Should we ban thousands of examples of 'feminicide' in cinema, cartoons and music clips?" The court in Montpellier said the poster did not promote violence against women in spite of its "doubtful" and "provocative" humour, 20 Minutes reported. Writing on Twitter following the win, Mr Menard described the case as an "inquisition in petticoats".